It turned out not to be an elaborate April Fools joke after all. The Board of Supervisors made good on their promise in March and fully funded the schools budget in a 7-2 vote (Delgaudio and Volpe opposed). 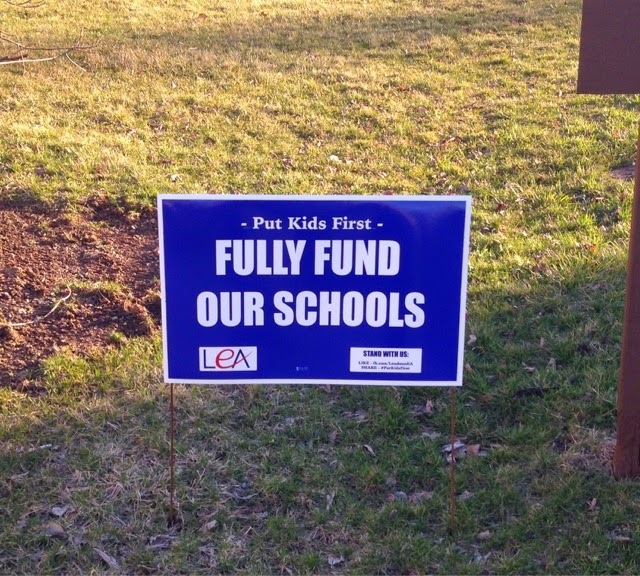 Besides Support Our Schools, the Loudoun Education Association put in an intense effort to better organize to influence the outcome. PTAs became more involved. The small schools that are continuously threatened with closure in reconciliation came out to support full funding. There's no question that speakers made more rational and informed arguments to both boards this year and that they continued to come out after being ignored was a testament to the strength of their belief in education. None of the current School Board members have announced their bids for reelection yet (filing deadline June 9). Still, Jill Turgeon and Debbie Rose voted against the School Board's budget before it went to the Board of Supervisors. 5 of the 9 supervisors have announced they are seeking reelection. (The filing deadline as an independent is also June 9.) Two of them didn't vote in favor of the budget (Suzanne Volpe and Eugene Delgaudio). One (Matt Letourneau) has no announced opponent at this point. My point is, it's not clear what an election year does to people. Districts are different. Alliances are not transparent. In fact, while those running again may have voted for full funding to increase their chances of winning, it could also be that those not running for reelection didn't feel beholden to the small minority who tend to vote in local elections. In any case, it likely had an effect. This is most cited by our elected officials as the reason full funding happened. Dr. Williams clearly put in work with the Board of Supervisors to get them on board and it was refreshing to hear. Dr. Williams also used the strategy of making cuts along with increases and came in with a much lower increase than last year. His budget presentation was changed by the School Board to add some needed restorations and improvements (class sizes, summer school) and add back in some of his cuts (middle school library assistants below state standards). The total increase requested (and now funded) was less than the increase the Board of Supervisors provided the school system last year. Enough analysis though. Let's hope that whatever happens in this election, we continue to pressure our elected officials to support our schools. There's plenty of work left to do.